Higher Education Commission Post-Doctoral Fellowship Programme 2019. Applications are invited from Pakistani/AJK nationals under the project titled Post Doctoral Fellowship Programme (Phase-III) of Higher Education Commission (HEC). The Scholarship is being offered in all across of studies/disciplines. 1) Candidates having local Ph.D. degree are encouraged to apply for Post-Doctoral Fellowship immediately after completion of their Ph.D. degree. 2) The foreign Ph.D. degree holders are required to serve five years in Pakistan before applying for Post-Doctoral fellowship. 3) Candidates must be employees of public/private sector HEC-recognised universities or public sector R&D organizations. 4) Only those candidates who meet the eligibility criteria will be considered for shortlisting. 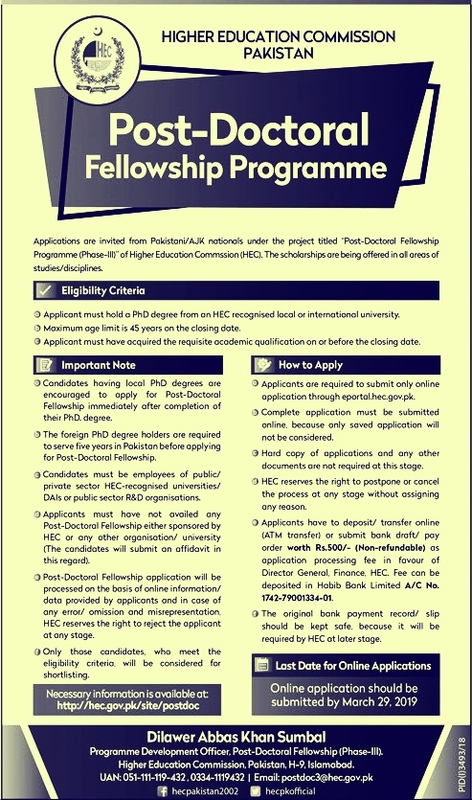 How to Apply for HEC Fellowship Program 2019?